The Belgian Railway company tweets! - Harold Tor. 24 October 2013 was a big day for the Belgian railway company, the NMBS/SNCB. Its first official tweet was sent by their CEO Marc Descheemaecker at 6am, and that launched the company’s foray into the social media world. Two weeks later, let us take a first look at the results of their Twitter endeavour. What is first apparent is the big discrepancy in the Dutch and French Twitter handles. 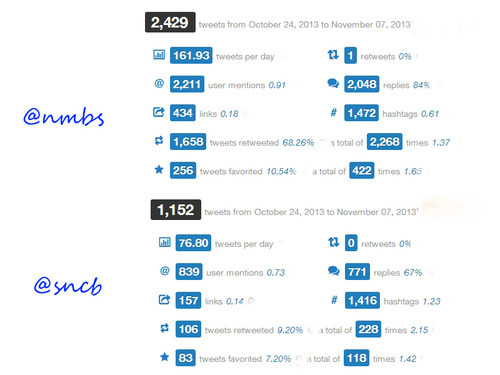 The Dutch handle @NMBS has more than 11,000 followers, while the French handle @SNCB has a mere 1987. Quantity does not equate quality, so the large number of followers does not equate quality conversation and engagement with customers. But the number of conversations is however an indication whether the company tweeters are sufficiently engaging with its users. 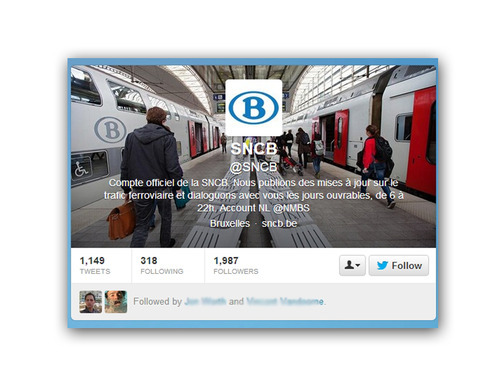 The daily number of tweets in the @SNCB handle is clearly less than its Dutch counterpart. The reply rate is at 67% while that of the @NMBS is at 84%. 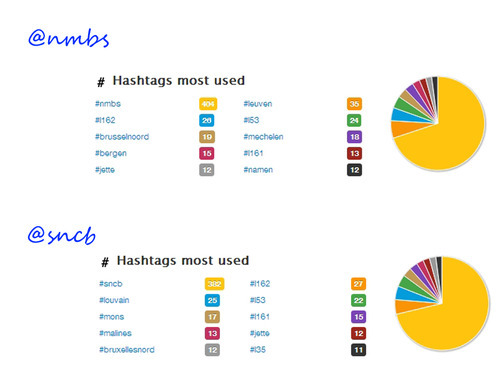 One good practice of the @SNCB is the good use of hashtags, at a healthier rate than @NMBS. But the clear inferior engagement is shown by a mere 9.2% retweets compared to the 68.26% retweets of the Dutch version. Of course, this can always be a chicken and egg question: whether it is due to the low number of followers that conversations are low, or whether the low number of conversations did not incur the interests of potential followers. Whatever the case, we need to analyse the conversations in order to gain better insights. Other factors come into play: the number of Twitter users in French-speaking regions, the usage habits and technological penetration rate there, and also the online and offline publicity efforts of the agency/company. For one, I know that the Twitter venture of the Belgian Rail is led by the RCA Group based in Dutch-speaking Hasselt, which has an office in Brussels. Perhaps the Flemish-centric nature of the company has something to do with the slow take-up of the French-language Twitter handle by the French-speaking community? The team in charge of the tweeting is featured in the background of both handles’ pages. Each team member has an acronym beside his or her icon so that the user can visualise the person’s face: This gives the impression that you are being served by a human being, not a robot. This is a really nice touch (see first image). The team is divided into French- and Dutch-speaking tweeters. The lousy practice by a lot of companies is to hire Dutch-speakers who can speak some French. The result is that French-language tweets thus become artificial and awkward sounding, a big No-No for social media marketing. In the case of RCA, there is a clear delineation between French and Dutch, and the French fluency can be seen in most of the tweets and the Dutch is completely fine. Although in some tweets, the language becomes indecipherable, perhaps because of the 140-character restriction. There is a clever use of hashtags in this case, which I have noticed: There are two types of tweets – one to respond to customer requests, the other some kind of robotic announcement of train delay/cancellation. This allows followers to quickly follow any problems with the train they take regularly. They can save the hashtags and have their app alert them if a tweet is sent out regarding the train or the station. That is a brilliant service to the client. On top of that, tagging station names will help drive search to the Twitter handles. So if someone wants to visit #Mechelen, a quick search on Twitter on #Mechelen will lead to the Twitter account of the company. This will help drive followers up. One way to look at why followers follow a handle is to analyse the most popular tweets: the most retweeted tweets and the most favourited tweets. 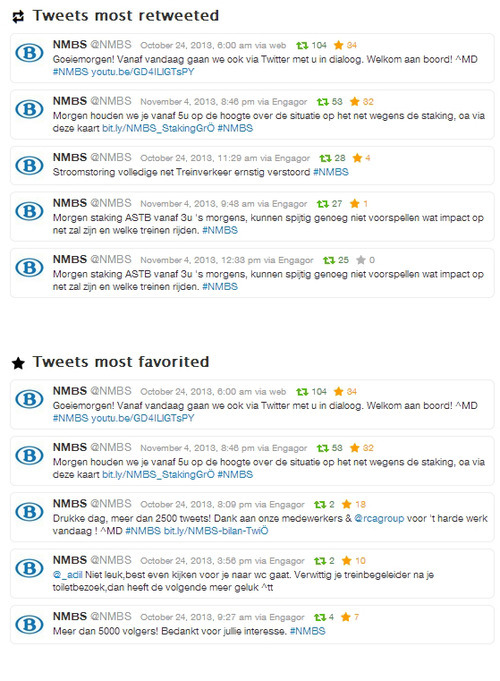 If you look at the @NMBS handle, you will see that the most retweeted tweet is the first tweet by the CEO, a total of 104 retweets. It is also the most favourited tweet with 34 favourites. 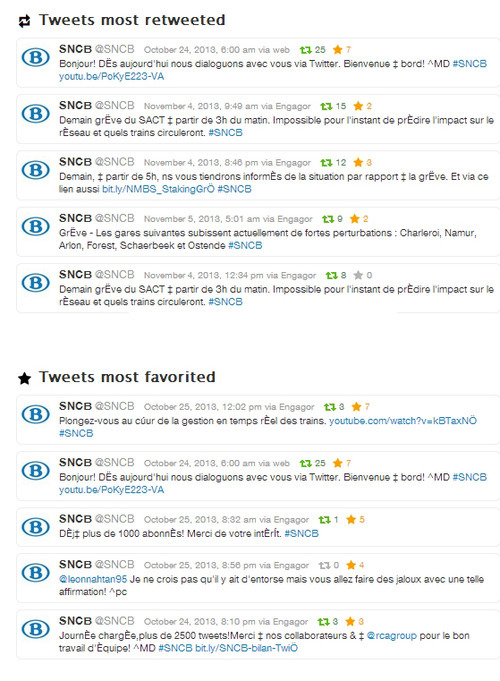 When you look at the @SNCB handle, the first tweet by the CEO is also the most retweeted, but only with 25 retweets. Indeed, the slow takeup by the French-speakers is already apparent right from the start. Again, it could be because of the offline publicity and press relations work that was not well done with the French-speaking media because the agency in charge is a Flemish company. A further analysis also displays similar trends. The most retweets and favourites concern the tweets about offering information and assistance in times of crisis, such as the strike or an electrical outage. This shows that users appreciate the assistance and information they can get via Twitter, which they cannot get from the app, the website or even at the station at such times. The worst a transport company could do with Twitter is to restrict the tweets to the working hours of your personnel. It shows that customers come AFTER staff. This is especially the case when you do not want to pay more for social media, you cannot expect staff to function 24/24 unless you pay them oodles of money to work in three shifts. The working hours of both @NMBS and @SNCB are clear: They work only from Monday to Friday, from 6am to 10pm. And they only answer questions related to train circulation and commercial aspects of train travel. If you look at the tweet timings below, the staff does more or less keep to the timing, although the French version tweets a bit later in the morning but works until one hour later than the Dutch version. 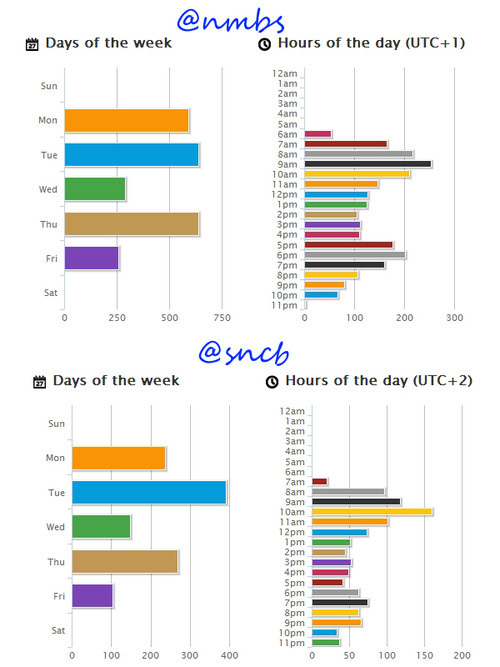 The Dutch version has a more consistent tweeting on Mondays, Tuesdays and Thursdays, while the French version starts slow and works furiously on Tuesdays and Thursdays. Both accounts lose steam towards the end of the week, Fridays are short days. Does this reflect the train situation accurately? I have been a train traveller for more than ten years. As far as I know, Fridays are the second most chaotic weekday after Mondays. This is because everyone wants to go home earlier but the train schedule remains the same because it is a weekday. Delays occur almost on every Friday as much as they do on a Monday. What they have not done well, is the promotion for the handle in the French-speaking region, because the agency itself is a Flemish one. Offline promotion such as on TV, newspapers, posters might increase the number of followers. The worst is them not offering services on weekends, as if trains stop having problems on weekends. This also gives the impression of the lack of customer care and staff putting themselves before customer needs.